While monoblock amps are all well and good for many purposes, often you’ll want a bit more versatility from your amplifier. All amps are designed so they output power into different channels. This helps with pairing the amp and the application. Put simply, the number of channels you need depends on the number of speakers you want to power. Ideally, you want 1 channel for each speaker. With a 2-channel amp, you can power 2 woofers, 2 separate speakers or bridge the channels to a single sub. It’s possible to power more speakers but more common to use an amp with more channels instead. 2-channel amps are equipped to play the full sound spectrum from 20 to 20,000hZ. Today, we’ll walk you through 7 of the best 2-channel amps to help elevate your car audio the easy way. Whatever your needs or budget, there should be something for all tastes. 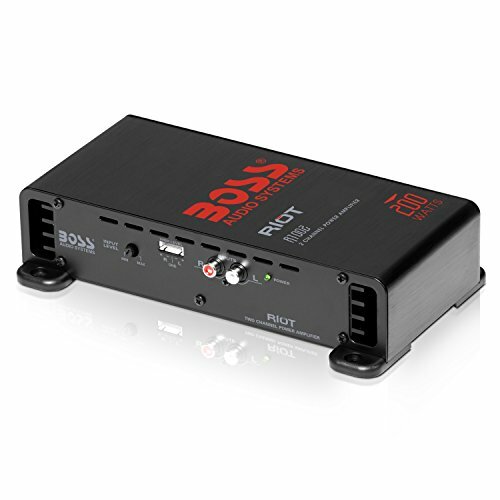 Boss Audio has carved out a reputation for peddling top-notch car audio at exceptional prices. This 2-channel amp from the Riot series continues that tradition offering you a great deal of bang for your buck. You’ll get more than enough power for even the hungriest of speakers and pretty advanced features given the low price tag. If you’re looking to power a sub or a pair of speakers, this sleek black Boss Riot is a smart choice for a 2-channel amp at an almost budget price. This class A/B amp will provide you with a full range of frequencies. You get 50 watts of max power at 4 ohms on each channel or 100 watts at 2 ohms. While you might be fooled by the price, this enables you to power even demanding speakers without the amp feeling burdened. RMS is rated at 38 watts x 2 channels (4 ohms) and 75 watts x 2 channels (2 ohms) so this unit is more than capable. The soft-start turn-on, 3-way protection against thermal, speaker short and overload along with very little by the way of distortion is genuinely impressive in such a cheap 2-channel amp. Dual speaker terminals enable hooking up multiple speakers fuss-free. For a pocket-friendly entrance to the field of 2-channel amps, the Boss R1002 deserves its place on any shortlist. For wonderful brand heritage without being charged the earth, Rockford Fosgate is the go-to choice for many car audio aficionados seeking a bargain. If you want to drive a sub or a pair of speakers from a very affordable unit, this 2-channel amp makes perfect sense. While the R150X2 is an entry-level RF amp, it still edges ahead of much of the competition. Although this 2-channel amp is considered low-end for Rockford Fosgate, make no mistake at all, this is a pretty powerful unit. It can push 50 watts into 2 channels at 4 ohms and 75 watts at 2 ohms. If you choose to bridge into a single channel, it will push 150 watts. Build quality is everything you’d expect from Rockford Fosgate. The sleek black chassis is solid and built to last and it looks pretty neat too. The LED indicator is a nice touch. If everything is running smoothly, this illuminates blue. If short circuit or thermal protect kicks in, the light turns red alerting you to a snag. While this amp is loud, the sound is not as clean as you’d hope for. There’s a little hiss when the gain is up but, in fairness, this tends to slip away when the music kicks in. 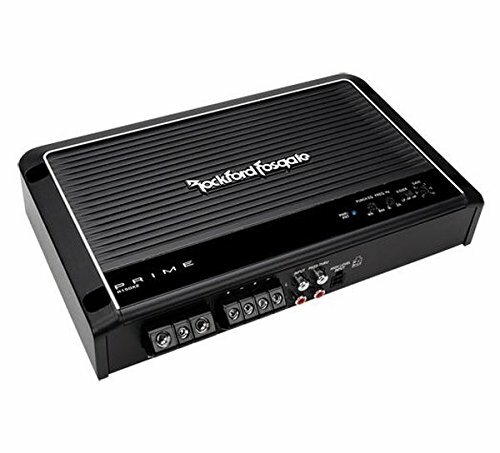 For a capable and dependable 2-channel amp at a price you’ll love, this Rockford Fosgate takes some beating. 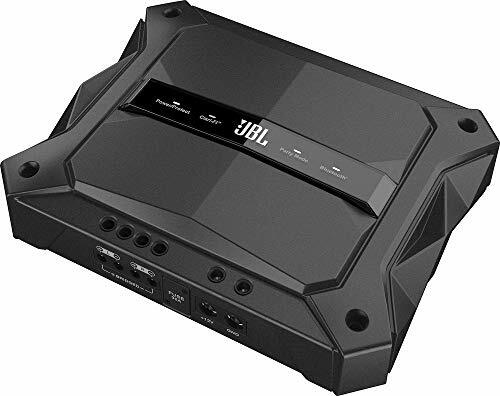 Something a little different next with JBL’s futuristic-looking 2-channel amp from its GTR series. You’ll be able to stream music from a Bluetooth-enabled device directly to this amp so you can get far more choice when it comes to music selection on the road. Whether you want to bridge this amp to a sub or connect it to a pair of speakers, you’ll get more than enough grunt for most needs from a brand you can rely on. Capable of serving up 100 watts of RMS power per channel, don’t be tricked into thinking the JBL looks the part without being able to back it up performance-wise. You’ll get 240 watts of RMS power if you choose to bridge this amplifier to a single sub. Bluetooth functionality is a wonderful touch allowing you much more choice of music on the go. Simply stream any tune from your Bluetooth-enabled device directly to the amp for a modern twist on the old-school 2-channel amp. We know what you’re thinking… Downloaded music is compressed and consequently tends to sound duller. Luckily, Clari-Fi signal processing restores that sound quality by reconstructing the parts removed during compression. Accepting low-level or speaker-level inputs, the JBL meshes with almost any system making it one of the go-to options for anyone looking for the best 2-channel amp. Polk Audio has surpassed themselves with this 2-channel amplifier. The PA330 delivers the best that class D technology has to offer at a very reasonable price point. For a versatile and agile amp that provides the power you need without going over the top, the PA330 is a stealth option for a smaller sub or a restrained pair of speakers. Everyone has different needs when it comes to in-car amplifiers. If you have a more modest set of speakers or a 10” sub, the Polk Audio PA330 is a cost-effective 2-channel solution to powering them efficiently. RMS power is 75 watts per channel at 4 ohms and 100 watts per channel at 2 ohms. That’s not going to punch a hole in your chest or shatter any windows but if you want a rich and clean sound, it’s more than enough power handling. As with all 2-channel amps, you get the flexibility of being able to power a pair of speakers or a single sub. We would point out that if you’ve got a 12” woofer or above, you’re better off looking for a more capable unit. For anything smaller, the Polk hits hard enough. 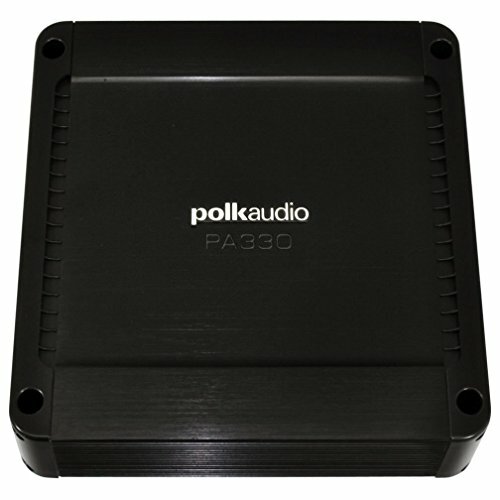 For anyone requiring a 2-channel amp that’s a breeze to install and won’t cost a fortune, the PA330 is a solid choice. Kenwood can be relied upon for amps that are built to last the distance without sacrificing sound quality or charging you exorbitantly. This 2-channel amp from the Sport Series peps up a factory system but comes fully to the fore when paired with top-notch aftermarket audio gear. Although it’s not the most crushingly powerful amp on the market, if you’re looking for a subtle way to enrich your music, the KAC-5206 is well worth further investigation. This Kenwood 2-channel amp is one of those rare products where it’s tough to find many reviews knocking it in any meaningful way. Sure, you can get more powerful amplifiers but for a winning combination of price, performance and brand heritage, it’s close to perfect. The compact amp delivers 60 watts RMS per channel and 150 watts RMS when bridged to a single subwoofer. While not earth-shattering, you’ll still get enough poke not to be disappointed at investing. What you dip out on in terms of raw power, you’ll gain with sound that’s rich, colorful and packed with detail. This amp is a class A/B and comes with standard MOFSET power supply. 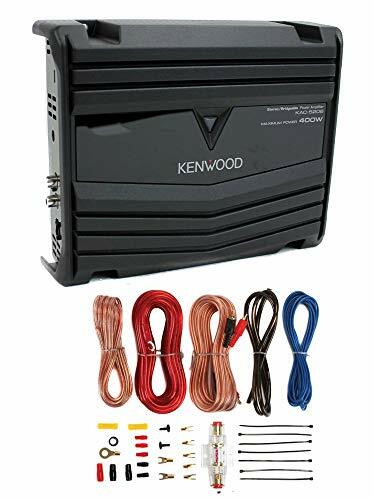 Quick and easy to install, the Kenwood is tailor-made if you’re just dipping your toes into car audio and want to get started without lashing out a king’s ransom. 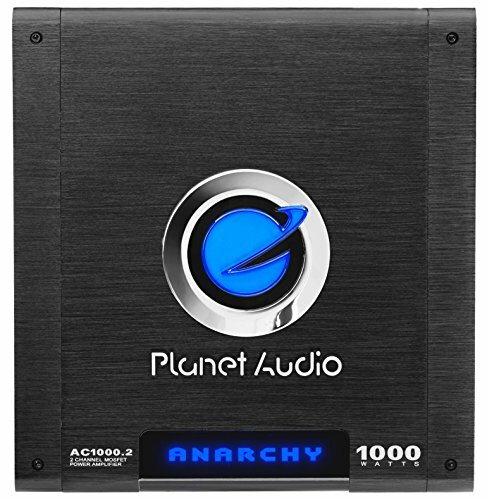 An extremely well-reviewed 2-channel amp with a welter of fans, the Planet Audio Anarchy is incredibly cheap considering the amount of firepower. This full-range 2-channel beast can power 2 speakers or 2 subs at 4 ohms or double that at 2 ohms making it an incredibly versatile piece of kit. Most manufacturers run fast and loose when quoting power handling and this Planet Audio amp is not capable of the quoted figures but still offers more than enough punch for most requirements. If you take the price into consideration, you really are getting an excellent return on investment with this 2-channel amp. The class A/B nature means that overheating is always more of an issue than with a class D amp so be aware of this and think about what demands you place on it before complaining it’s running hot. As the name suggests, this amp doesn’t adhere to normal rules. You can power 4 speakers or 4 subs at 2 ohms which is a notch up on most 2-channels units. If you’re using it with a subwoofer, there’s a remote provided for your convenience. If you want plenty of flexibility in a reasonably compact package, this Planet Audio 2-channel demands a road test at your earliest convenience. If you want a 2-channel amp you can also flick easily into single channel mode with a deceptive amount of power considering the price and size, think long and hard about this Pioneer. Set-up is straightforward unless you’re an absolute beginner. While this unit is no use for large subs and won’t shake your bones out, it’s a solid small amp at a highly attractive price point. It’s always tough to accurately compare amps because of the huge discrepancy in stated performance and intended purpose. 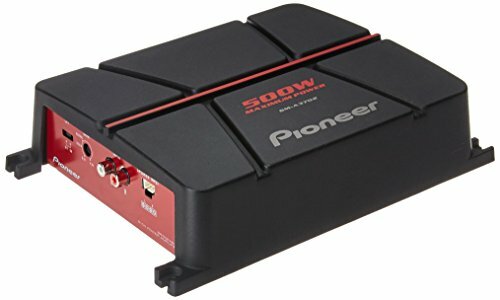 If you’re looking to start out on your car audio journey with a budget-friendly 2-channel amp that’s a breeze to install and extremely flexible, you could do far worse than this Pioneer. If you’re working with 2 speakers, you’ll get 60 watts of RMS power per channel which is more than you’d expect at this price point and size. You can power a smaller sub getting a surprising range of bass along with the crispness and clarity Pioneer are renowned for. The low-pass filter helps out in this regard. The amp has relatively few options but we’d always prefer more limited functionality than a unit that bites off more than it can chew while compromising sound quality in the quest for extra features. Overall, this is one of the best inexpensive 2-channel amps you can find. We hope you’ve enjoyed this look at the best 2-channel amps on the market. We’ve tried to cover amplifiers from a range of manufacturers including all the usual suspects from the car audio world. We also attempt to showcase products at a variety of different price points rather than sticking to the high-end or budget ends of the market. We’ve got more plenty more reviews of amps right up to 5-channel monsters coming up. Pop back soon for more impartial advice to help you make an informed decision about your car audio gear.